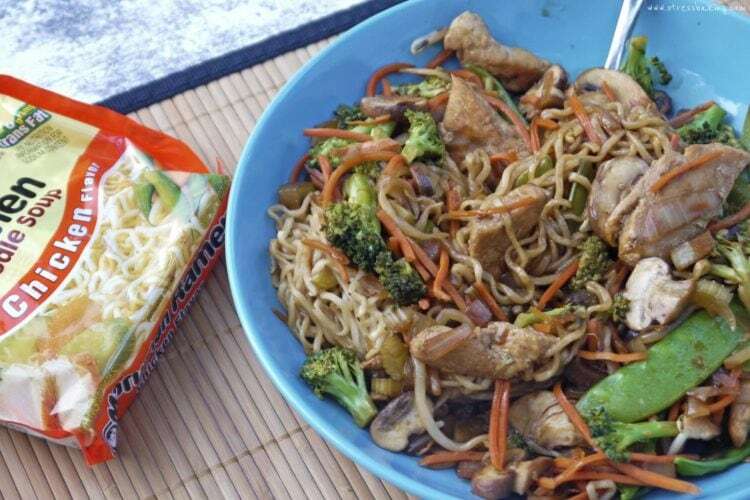 A simple stir fry chock-full of vegetables and chicken using an old college staple as the base: Ramen! Welcome to the first week’s ramen recipe for the Ramen & Funfetti Challenge! There’s such a stigma around ramen. It’s the food all college students end up stockpiling in their dorm room after their first semester. You start out all optimistic that you’ll always eat healthy, and you’ll get food at the designated times from your school’s cafeteria and it goes well for a while. But then you miss dinner one night because of a class, and you’re starving. So you head to the nearest convenience store and grab a few containers of instant ramen – just for tonight. And soon enough, you’ve gone to the store, bought 100 of them because they’re like 10 cents each, and you’re suddenly living off containers of Creamy Chicken and Shrimp flavored sodium bombs. Shhh… it’s okay. It’s happened to the best of us. We’ve all been there, and I’m here to help. Just because you’ve gotten older doesn’t mean you’re rolling in money (I would know). But you’re probably not exactly nostalgic for the old days of eating ramen out of a styrofoam container, either. I’ve found a decent compromise and you don’t even need the “fancy” instant ramen – just a 3oz packet of the noodles will work just fine. 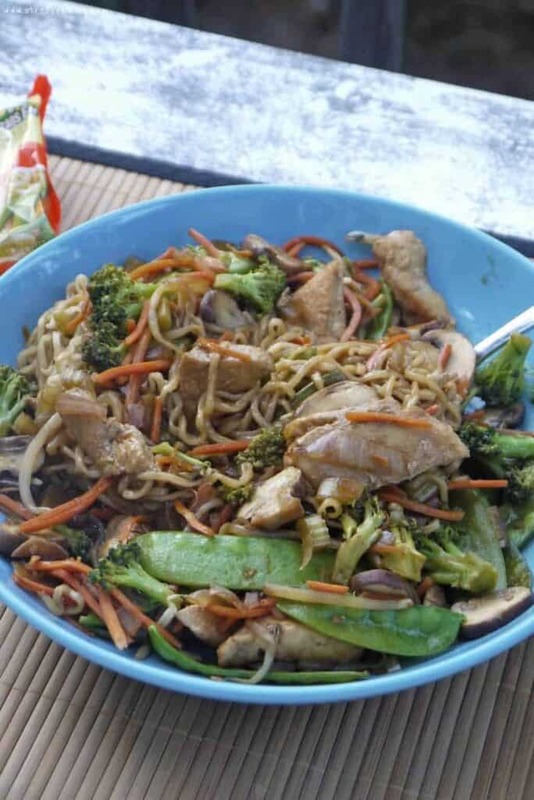 It’s super easy and can probably be ready to go in about 15 minutes – all you need is ramen, chicken, vegetables and my current favorite pre-made marinade: Lawry’s Sesame Ginger Marinade. You don’t have to use the veggies I used – that’s the great thing about it! I used what I had on hand – if I had it, I would have added water chestnuts and those adorable little baby corn. Because adorableness plays into my meal-preparation decisions. Obviously. 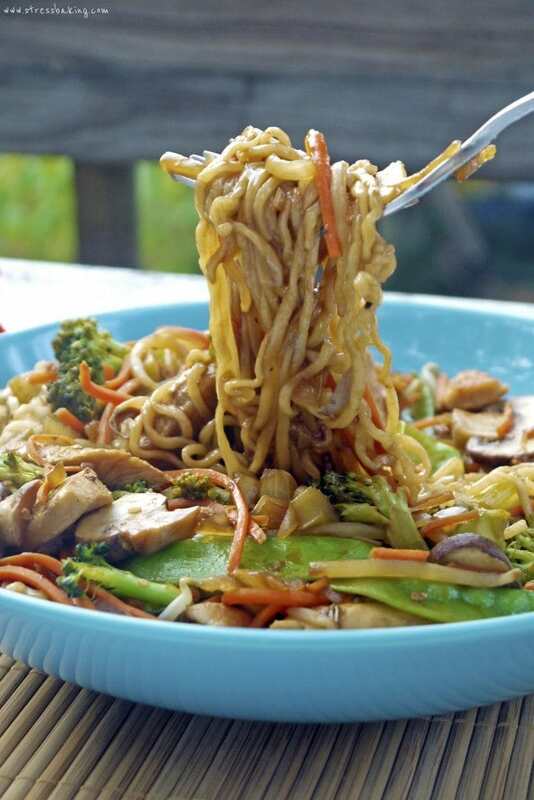 You would never know that the base of this is simply a package of cheap ramen – so if you make this for friends or family, just don’t tell them! Prepare all your vegetables: chop the broccoli, shred carrots (I used pre-packaged shredded), slice mushrooms, dice onion and chop celery. Combine all veggies except onion and set aside. Prepare chicken by seasoning with salt and pepper, and slicing it into thin strips. Heat 1 tablespoon sesame oil in pan over medium high heat and add chicken. Pan fry until cooked through and outside is browned. Set aside. In a wok or large saucepan, heat 1 tablespoon of sesame oil over medium heat. Add onion and saute for 1 minute. Add the rest of the vegetables and cover. Heat 3-4 minutes, stirring occasionally. 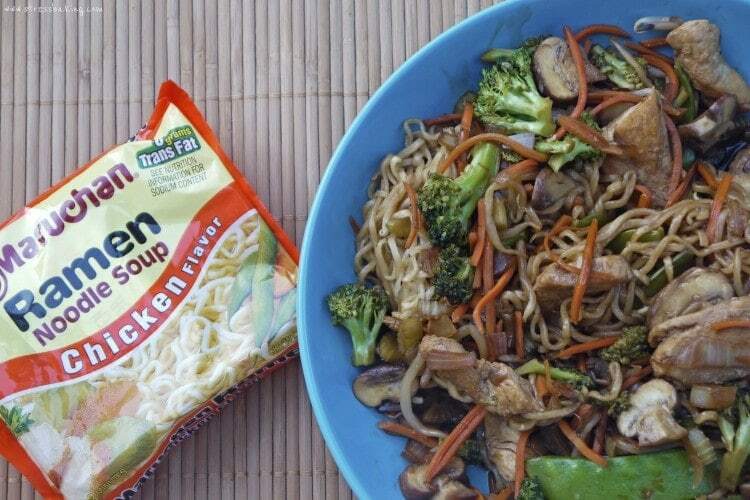 Uncover wok and add the chicken. Bring a medium pot of water to a boil and add ramen, stirring occasionally for three minutes. 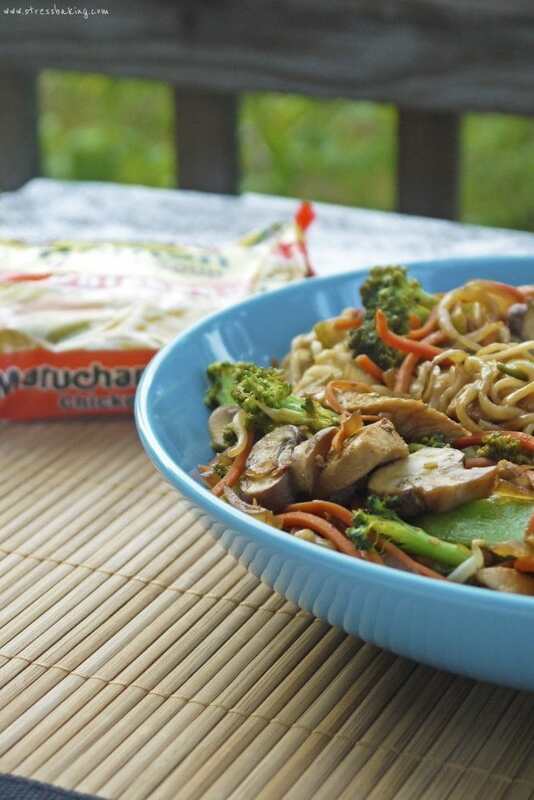 Drain and add noodles to wok. Add Sesame Ginger Marinade and stir until all ingredients are evenly coated, heating another couple minutes. Disclaimer: Lawry’s has no idea who I am – I’m just a fan!